Trade Paperback: University of Michigan Press, 1995. David Lehman's second book in the Poets on Poetry series confirms his stature as one of our leading literary figures. He is also a literary critic with a rare ability to elucidate thorny ideas and controversial issues in a way that is both entertaining and instructive. 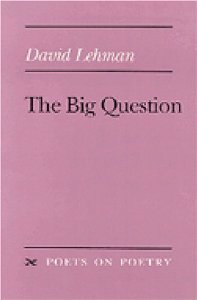 THE BIG QUESTION leads off with a major essay explaining and exploring the concept of postmodernism. The next sections include pieces about poetry and fiction, lives and letters, and criticism and controversy. Other "big questions" addressed include political correctness, the genre of literary biography, academic life and deconstruction. There is a humorous piece on poetry "slams" and the whole "downtown" poetry scene, a feisty op-ed column (on the deconstruction of the Gettysburg Address), a pair of wickedly satirical poems, as well as a group of exceptional book reviews. The subjects covered range from Philip Larkin to Philip Roth- from the greatest poetry hoax of the twentieth century (which took place in Australia during World War II) to Charles Dickens's unfinished last novel- and from nineteenthth-century American poetry to the political career of Martin Heidegger.